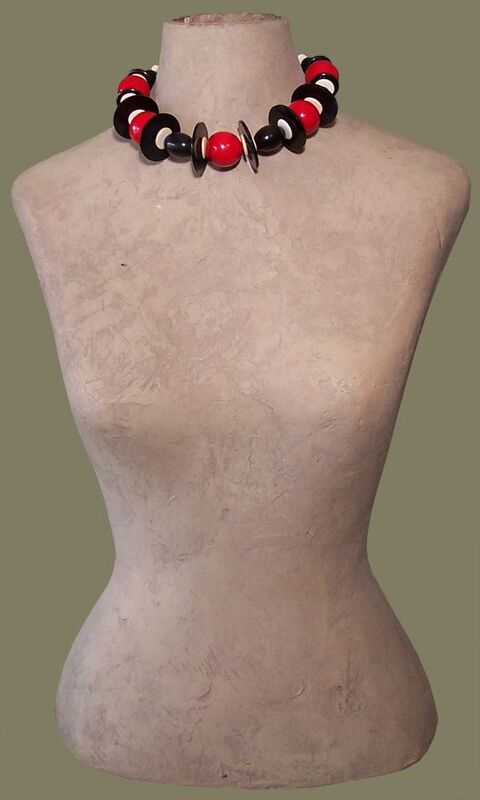 “Mid-Century Gal” Necklace: Mid-Century Vintage Plastic Beads and Vintage Plastic Buttons in Black Join Forces With Eye-Popping Chunky Round Beads in Red. The Reds are Handmade Papier Mache Beads From Japan, circa 1950’s, and Have a Bright, Shiny Lacquer Finish. Black and Off-White Wood Beads Complete the Look. An Exclusive, One-of-a-Kind Beaded Necklace for That Artsy Jewelry Gal. This Artisanawear Costume Jewelry Piece Packs a Punch, and Spells Confidence.